Just a little peek at next release from Blackbird, Anniversaries of the Heart #7 “Swan Lake”. This release also features the first bonus piece. I just love this bonus piece, I will have to stitch this one. It should be out to the distributors in about a week, and then we will be able to get it in. It is stitched on a 30 count R & R fabric which we will also have. Something I have in the works…..I fell in love with this paper at Paper Creations. Since I am in a box mode, I am stitching another pattern out of Blackbird’s Honeysuckle Manor in this wonderful shade of teal blue. This will go on the top, and I will do something wonderful with the papers. 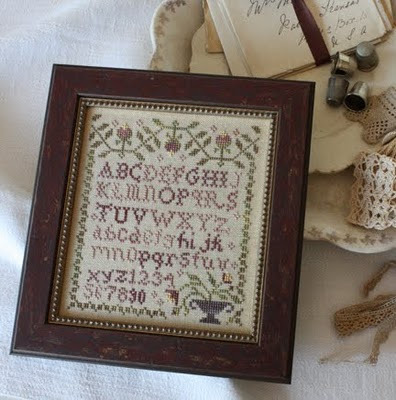 I have stitched this design once before for a box top, and couldn’t find a paper that I liked to go with it. I did this one backwards, I found the paper and then picked the thread. I found it easier that way. I will post when it is finished. I just finished framing this cute Lizzie Kate “ABC Halloween”. I stitched it up, and it will be a shop model now, until I decide I can’t live without it at my house. I stitched it in the colors supplied with the kit except for the addition of the purple spider button. I though he was a cute touch. If your really into Halloween, then you can’t resist this set. It is “creepy Crawly” by Blue Ribbon Designs. 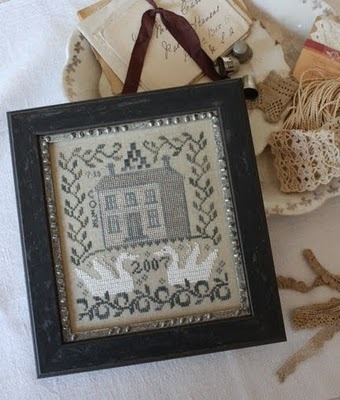 Carolyn stitched this using a combination of linen fabrics and using ink to distress them. Remember our tip for painting your pin heads any color you like to match the piece you are using them on…that tip was used on these pins. Carolyn does an excellent job at finishing. She is always happy to teach a finishing class. Let us know, and if we get a few of you that would like to get together and work on your finishing we will get Carolyn to set up a time. Our model is even on display in its own crypt. Aren’t they a scream…. Thanks to my wonderful son Taylor, we really have a ladies bathroom now. Now our old bathroom served a purpose, it was mainly a storage room, and if you walked in sideways and turned just right, you could actually use it as a bathroom. It was dark, and I always tried to hurry as fast as I could. Now look at it! With the addition of the storage garage we were able to clean it out, paint and decorate. We have a cute cabinet for our lady things, a new light fixture, a garbage can with a lid and a beautiful paint color. Can you tell I am thrilled! Thanks Taylor, you worked really hard on it!